Fox & Hounds sweaters are made of 100% acrylic. Hand-wash. Line dry. 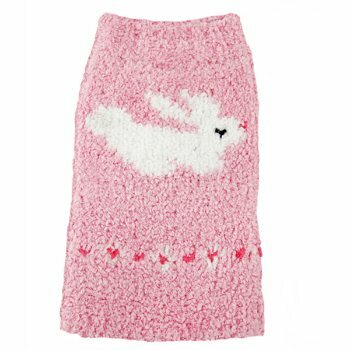 Pink bunny dog sweater, great for Easter! Kit & Pups is a premium product line catering to puppies and kittens. These premium products are crafted with high-grade fabrics for the ultimate in puppy pampering. *Please measure from the back of the neck to before the tail.